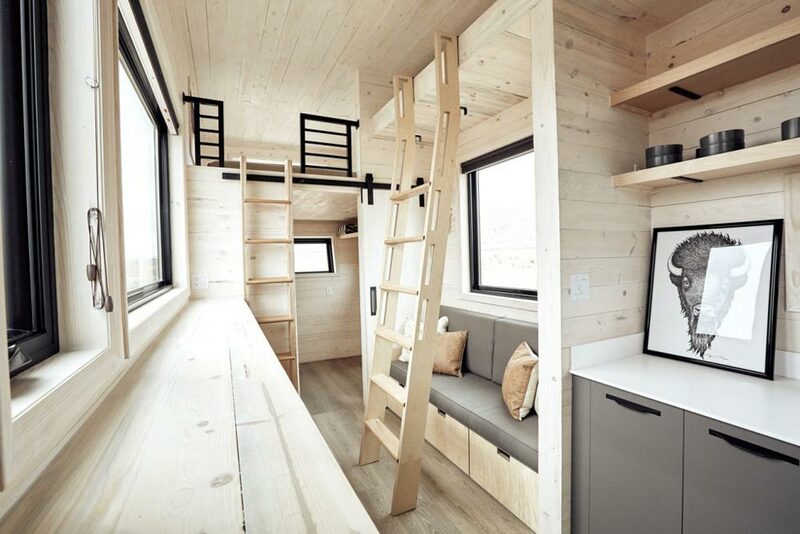 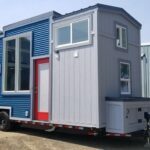 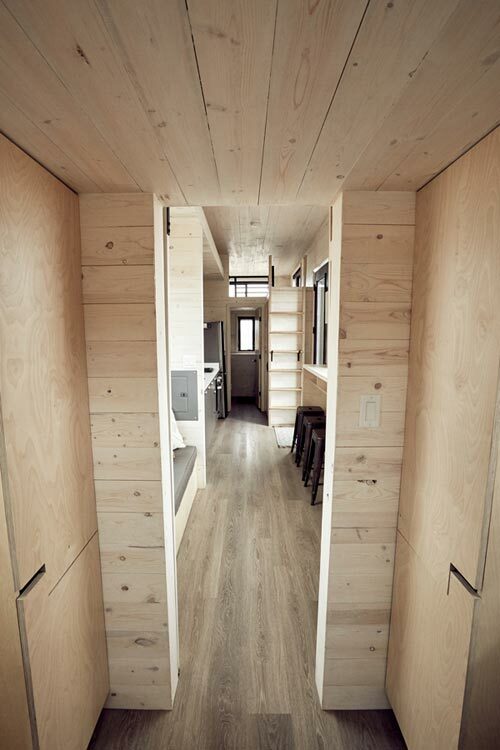 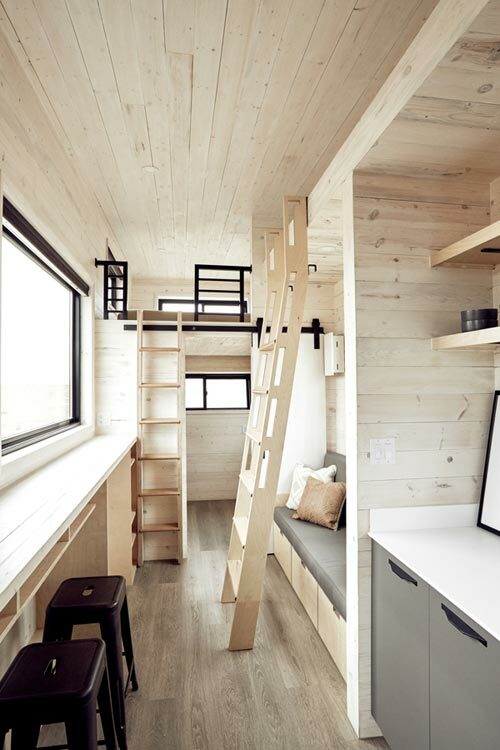 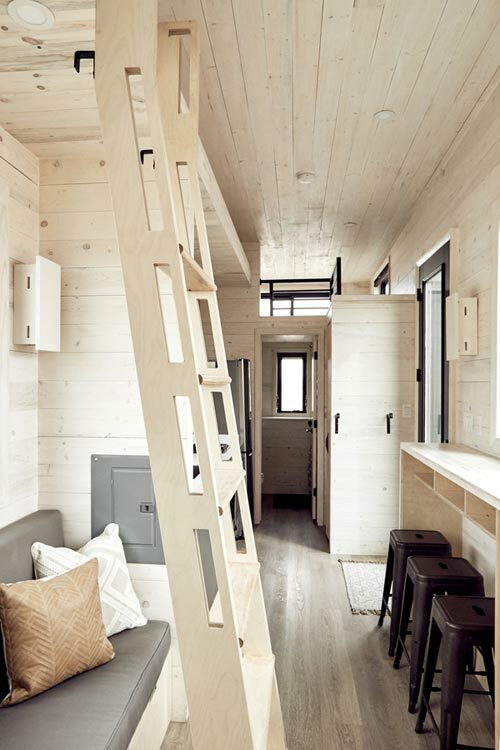 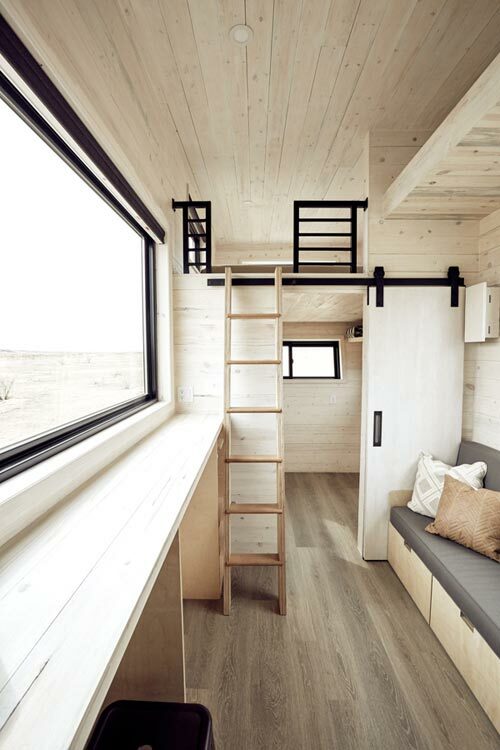 The Drake is the debut model tiny home for Colorado-based Land Ark RV. 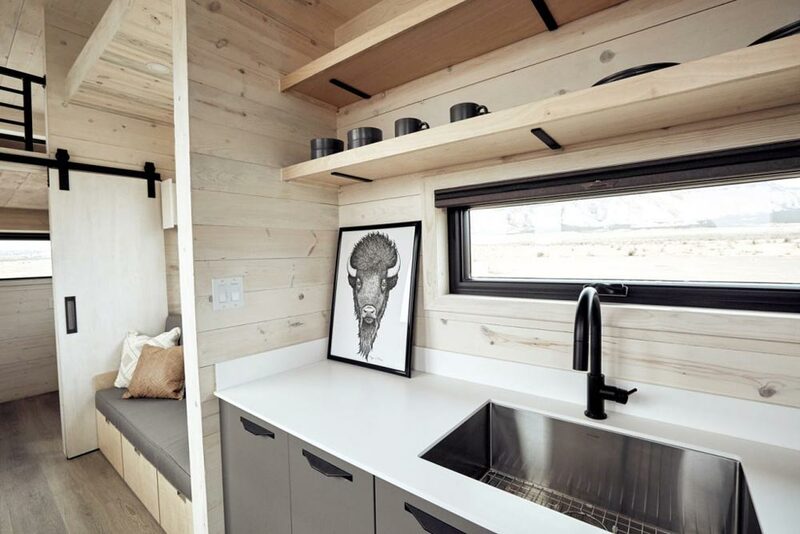 Land Ark was founded by Brian and Joni Buzarde, a couple that designed, built, and have lived in their own tiny house since 2012. 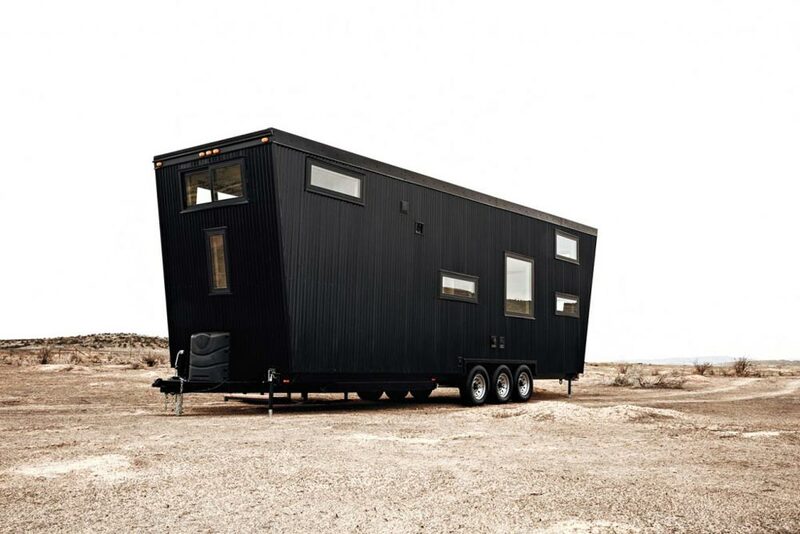 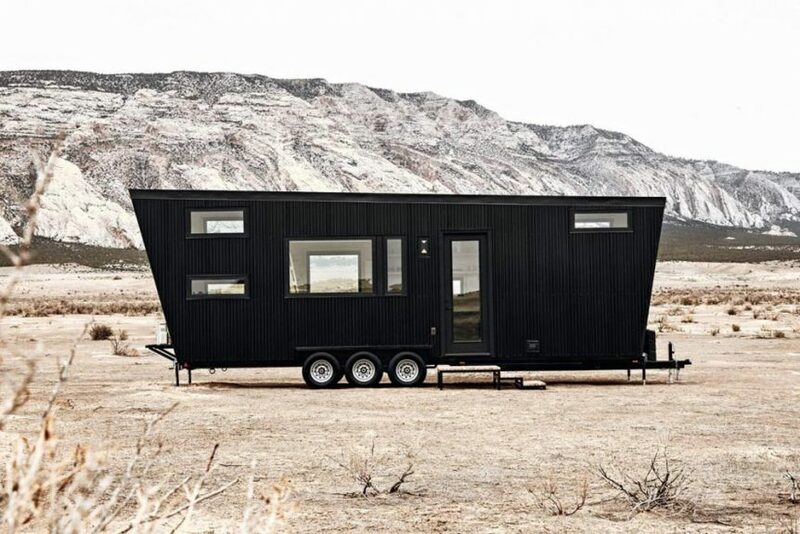 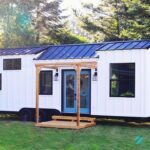 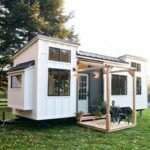 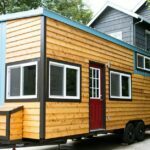 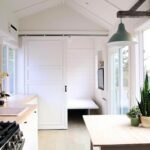 This 357-square-foot tiny home measures 30-feet long and has a gorgeous maintenance-free black corrugated metal exterior. 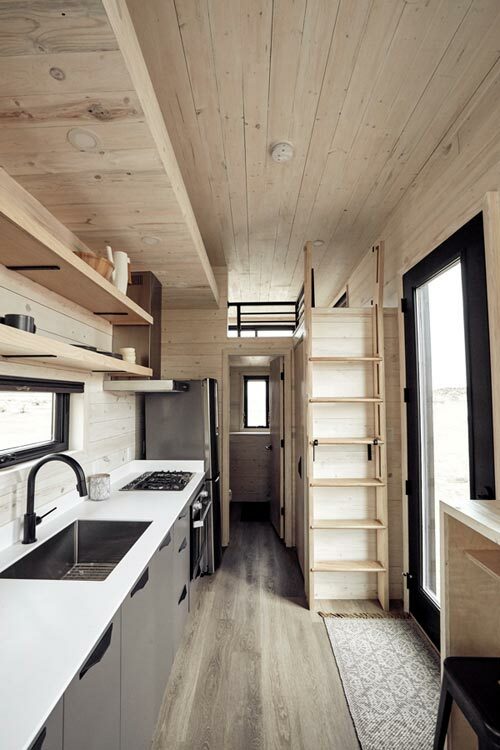 The interior offers a contrast with its white-washed pine walls and ceilings, and light colored waterproof luxury vinyl plank flooring throughout. 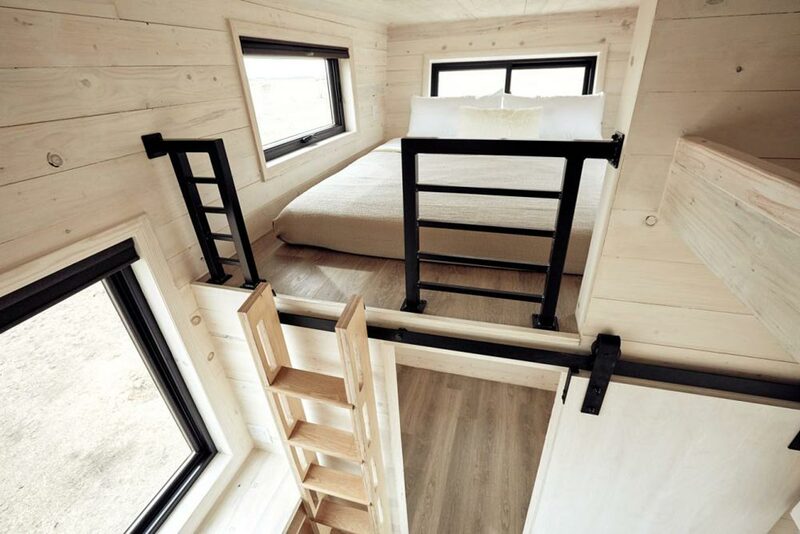 The Drake sleeps up to six with its king bed master loft, queen bed secondary loft, and main floor flex room that fits a queen bed. 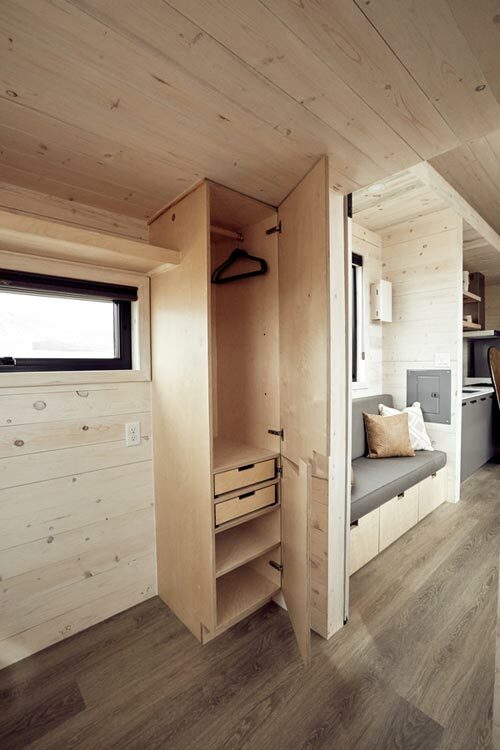 The flex room has built-in closets with hanging rod, drawers, and shelving. 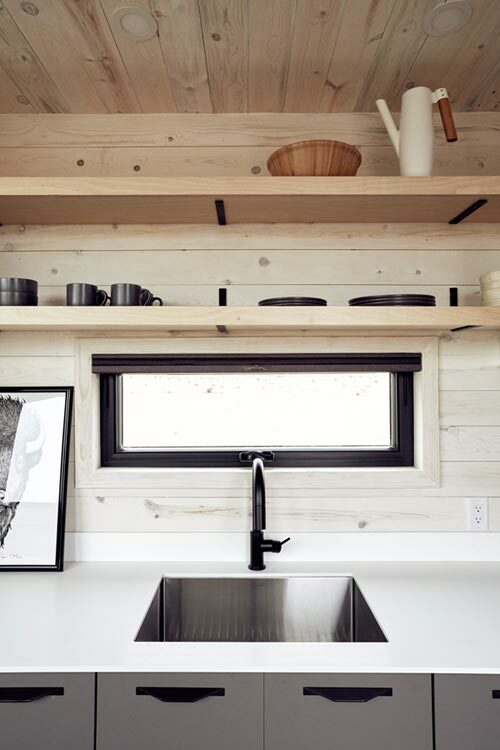 The kitchen features solid surface countertops, acrylic cabinets with matte black pulls, and a modern stainless steel sink. 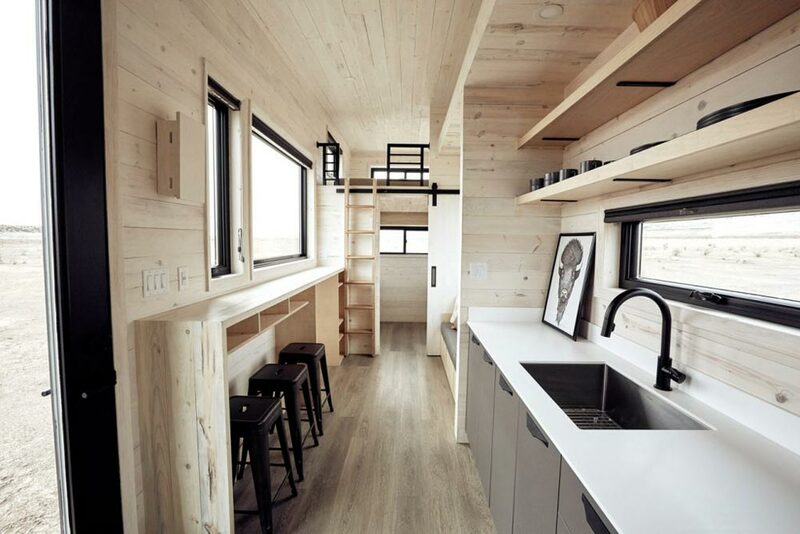 Appliances include a 10.1 cu.ft. 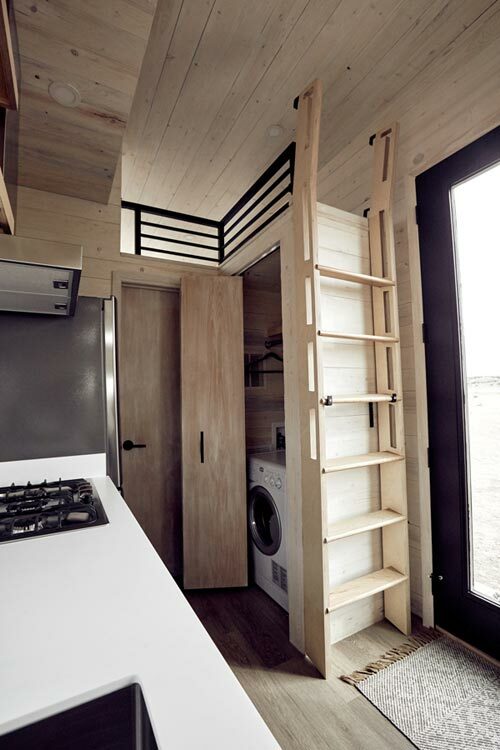 stainless steel refrigerator, three burner gas cooktop, gas oven, and cooktop vent. 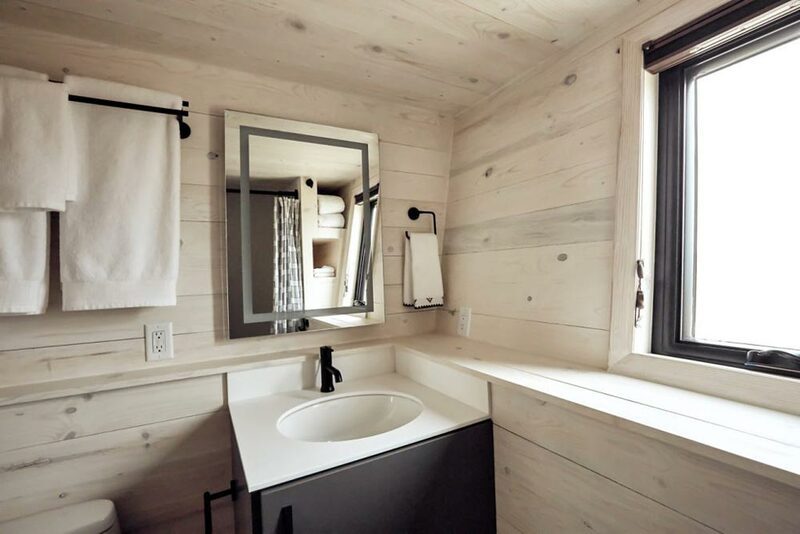 The full bathroom has a 30″x60″ bathtub/shower, matte black faucets and shower trim, a one-piece toilet, solid surface vanity with lighted mirror, and built-in linen storage. 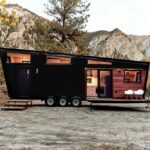 For more information about the Drake, please contact Land Ark. 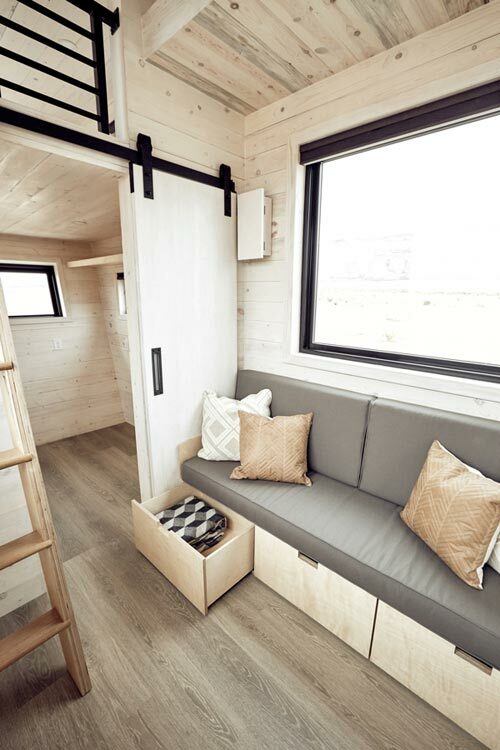 Also available from Land Ark: Draper.